Universities are the backbone of tertiary education in a country and institutions that provide the most comprehensive set of learning tools. There was a time when a country would have a couple of universities and be labeled as a place to travel to achieve a better life. But now, every major city in the world has tens of universities which make them a hub for attracting students from all over the world. 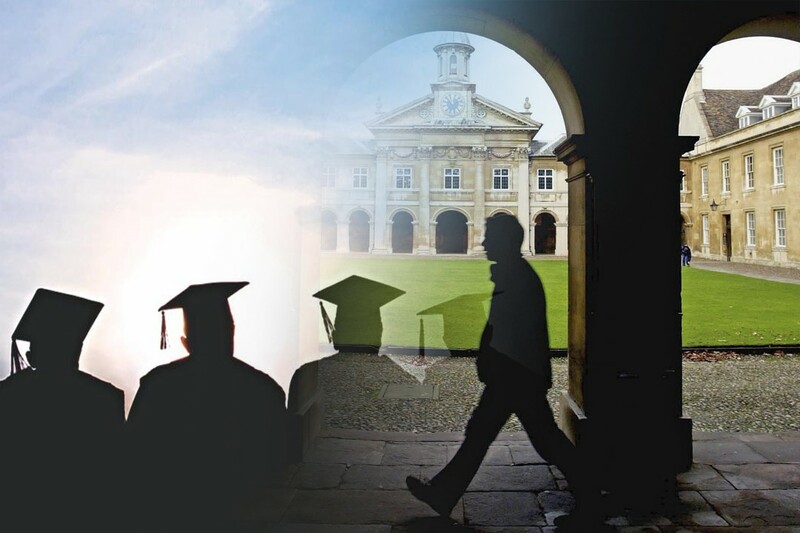 Today, several colleges and institutes that specialize in a particular field of study are also deemed equal to universities. Because even though the term ‘university’ applies to the system of schools providing tertiary education in distinct disciplines, it is now being translated into institutes that provide tertiary education with at least a four-year bachelor’s degree. 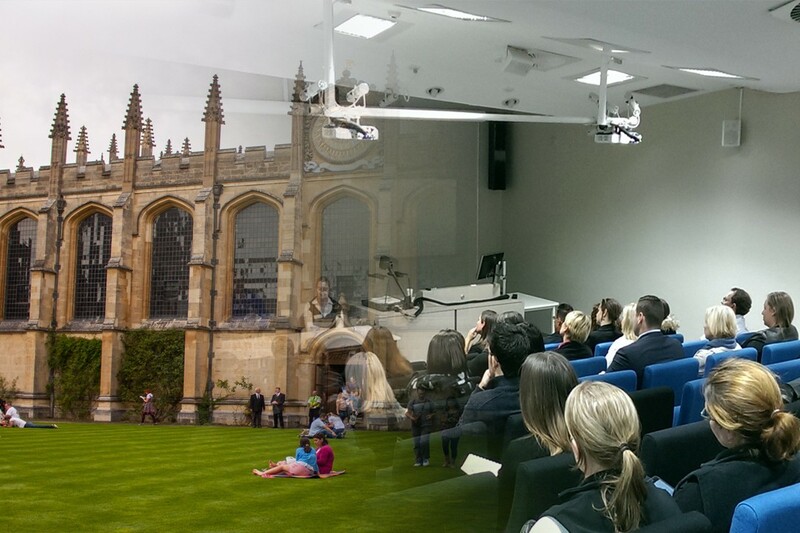 Universities also have another differentiating characteristic than simple college and smaller institutes. That is that they are more research-oriented and contribute towards education with discoveries and methodologies. Different countries and cultures have different ways of delivering education, but the basic principle remains the same. 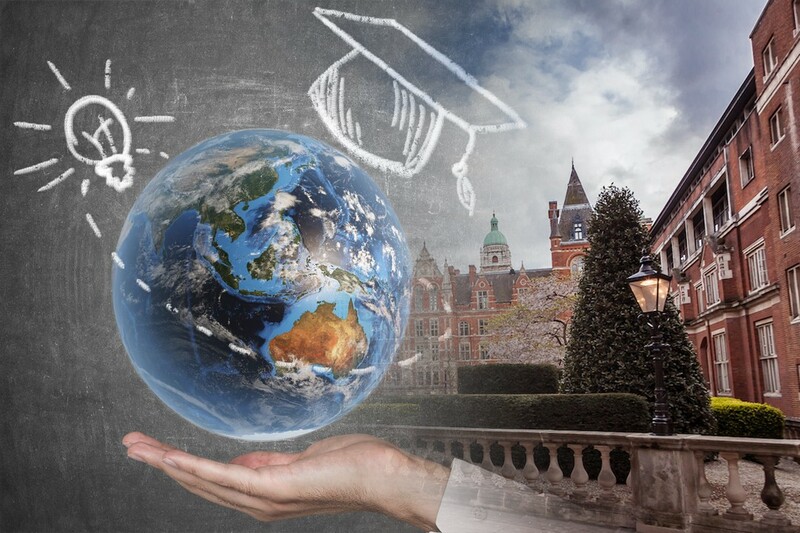 There are over 26,000 universities that are accepted as such all over the world. 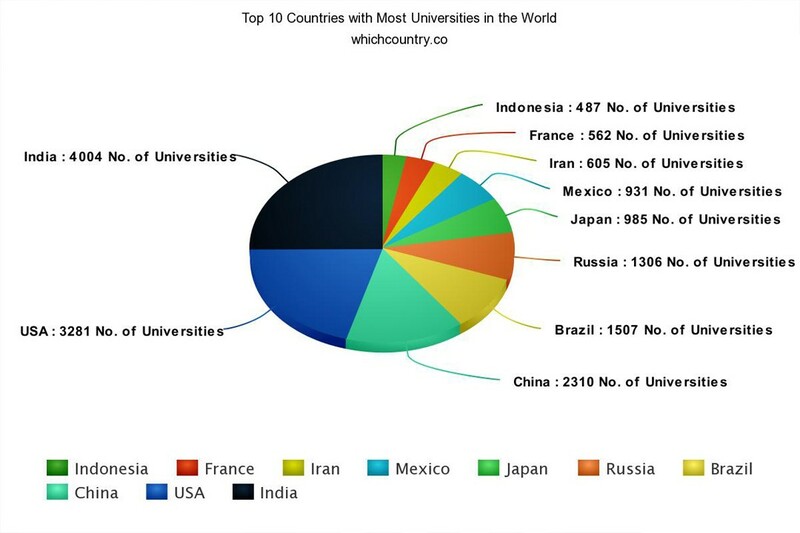 Following are the top 10 countries with most universities. Over the years, Indonesia has become one of the most advanced Muslim nations in the world when it comes to university education. Universities like University of Indonesia, Bandung University, and Gadja Mada University are in the top 500 of QS world university rankings. France has been an improving force when it comes to the standard of universities in the past couple of centuries. Now, France has 39 Universities in the top 1000 for QS rankings, 17 in the top 400, two in top 100 with Ecole Polytechnique ranked 53rd and ENS Paris ranked 33rd. It is not a surprise that France is ranked 6th in the world for the strength of its university system. Iran has been a hub of higher education from people coming from all over the Middle East and other neighboring countries. Iran offers a unique cultural experience and the University of Tehran along with Iran University of Science and Technology feature in the QS university rankings. Mexico has been one of the top destinations for education when it comes to the Latin American people. People from all over South America and even North America come to study in cities like Mexico City and Guadalajara. Mexico has eight universities in QS top 1000 university rankings and has UNAM as its top-ranked university at 128th. Japan has had emphasized advanced education system ever since the 20th century and cities like Tokyo, Osaka, Nagoya, Kyoto, et al. have some of the very top universities in the world as well. Japan is ranked 10th by QS Higher education system ranking for 2016 and has five universities in the top 100. Russia is the largest country in the world, and even though quite a lot of it is inhabitable, the rest has millions of people. Russia has over 1,300 universities to cater to that population and the students it attracts from all over the globe. Russia has one university in the top 100 (Lomonosov Moscow University) and another that ranks within top 250 (Novosibirsk State University). Brazil is the largest country in South America with cultural hubs like Rio de Janeiro and Sao Paulo. Brazil is ranked 22nd in the world when it comes to the strength of the university system in the country. China is ranked 8th when it comes to the strength of the education system in the QS rankings and also has several tops ranked universities in the world. China’s foreign education attraction is not as strong as countries like USA, Germany, UK, Canada, and Australia, but the country still needs to have this many universities to cater to its huge population. 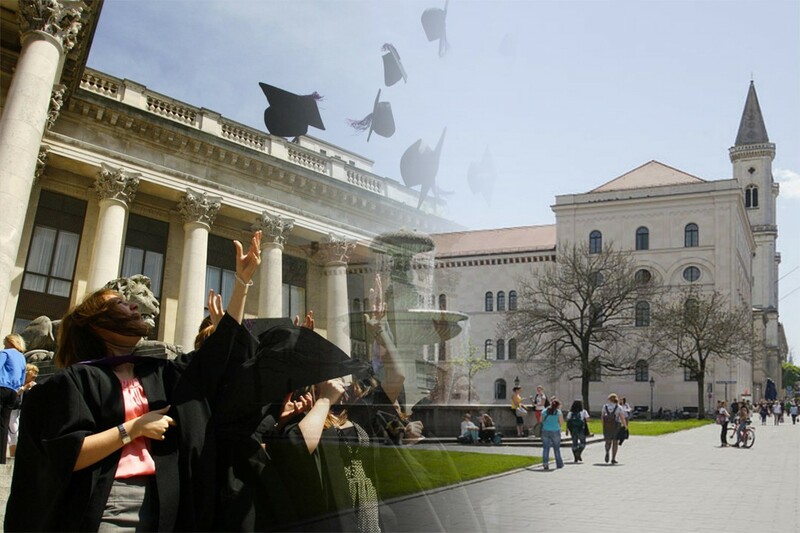 China has five universities in the world top 100 with Tsinghua University at 25th and Fudan University at 40. USA is the undisputed #1 when it comes to the standard of tertiary education and also has the most universities in the QS university rankings top 1000, top 500, top 100, top 50, top 10 and even the top 5. In fact, all of the top four universities in the world – MIT, Harvard, Stanford, and Caltech – hail from the USA. With its 50 states and quality universities all over them, USA has a very comprehensive education system. India ranks at #24 when it comes to the strength of its higher education system and has a lot of universities to cater to its population of 1.3 billion. Even though not a lot of the Indian Universities feature in the QS 1000, the IT sector of its education is considered one of the best in the world. That is why its two out of three universities in the top 200 are Indian Institute of Technology Delhi and Bombay.